The key to achieving these extreme vibration and shaker shock G-levels is the Model T2000 vibration system and its solid metal, inductively coupled armature. This unique Induct-A-Ring armature weighs only 110 lbs and can generate up to 25,000 lbs pk sine / 23,000 lbs rms random and 67,000 lbs pk shock force. It uses a solid metal coil with no winding on the moving armature, allowing it to be driven at extreme G values without coil failure. 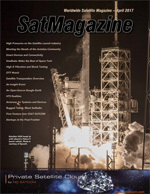 The random vibration associated with a rocket launch is a brutal dynamic environment that often calls for highly shaped PSD profiles as seen in Figure 1 above. 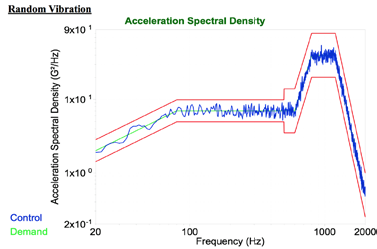 The highly shaped PSD profile in Figure 1 includes substantial g2/Hz energy in a part of the test spectrum where the electrodynamic shaker armature exhibits “resistive” impedance. This means that output current and voltage from the Power Amplifier in this resistive band are “in-phase”—generating high heat loads for the shaker armature cooling system. A conservative shaker cooling system is essential. Also notice that the Figure 1 PSD profile has reduced g2/Hz demand in the 1,200 to – 2,000 Hz band where most electrodynamic shakers exhibit armature resonance. As a result, the full “resonant boost” from the shaker armature Fn that can be taken advantage of with a flat PSD profile is not as effective when running this highly sloped PSD profile. To make up for the diminished armature Fn boost and to achieve the full 173.4 G rms level, the Vibration System must have a large KVA Power Amplifier to provide extra shaker armature drive. Experior Laboratories runs this complete profile without band splitting. Most other test labs have to run the above PSD profile as a series of split frequency band tests, due to max g limits of their shaker and/or output current and voltage limits of their power amplifier. This same T2000 Induct-A-Ring Shaker also has excellent low frequency performance, delivering up to 3-inch pk-pk displacement, which is allows sine testing in the low frequency range required by specifications such as wind milling vibration. Figure 1. Random PSD @ 173.4 G rms with 40.0 g2/Hz in mid-band. C. Addition of a shock impedance mode inside the T2000 Shaker to maximize power transfer between the 240 KVA Amplifier and the T2000 Shaker for SRS profiles that demand high drive voltage at the armature input. 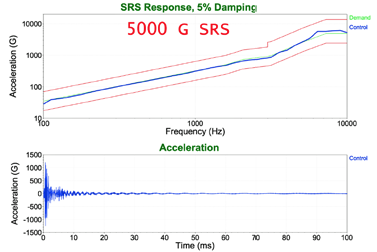 With these technical factors in play, SRS levels as high as 5,000 g have been achieved out to 10,000 Hz—see Figure 3—thereby substantially exceeding the Far Field SRS limits. Mid Field SRS: Experior Laboratories is now in a strong position to deliver SRS testing with its T2000 Shakers for Mid Field SRS Pyroshock specifications (out to 10 KHz) at previously unreachable g-levels. Shaker shock is performed using a PC Controller with accelerometer feedback to lock in the SRS profile as measured at the control accelerometer location. Once the control equalization is completed at low level (typically at -20 dB), the SRS test is brought to full level without overshoot and within relatively tight tolerance bands over the entire frequency range. Figure 2. 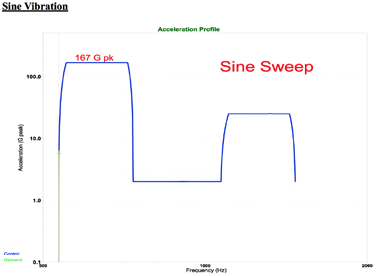 Sine Sweep Vibration @ 167 g pk. The drive spectrum can then be memorized by the Controller so that all subsequent SRS shocks can be produced with essentially identical profiles. Pyroshock testing simulates the high G, high frequency shock environment associated with pyrotechnic events, such as rocket stage separations. These are sometimes called “SRS Shock” tests, as they are specified with a Shock Response Spectrum (SRS) profile. This profile is a representation of the maximum predicted acceleration of a system across a range of assumed natural frequencies. Experior Laboratories’ Kinetic Impact Pyroshock Simulation (KIPS) test system is able to simulate near- and mid-field Pyroshock, experienced by the parts closest to a pyrotechnic event, by using high speed impact to excite a tunable resonant beam. By adjusting the impact force, location, and damping, this platform allows for highly customizable shock generation. Pneumatic actuation of the system allows for quick setup and resets. Figure 3. SRS Shaker Shock @ 5,000 g to 10 KHz. Adjustable resonance allows for an acceleration boost in only the desired frequency range. For shocks with a specified Te (event duration), adjustable muzzle velocity, impact mass, and custom damping materials allow us to customize shock duration while meeting acceleration requirements. The KIPS system offers short transients and a uniform shock input that can provide near-equal measurements at multiple fixture mounting points. The design, which has a net-zero displacement, ensures narrow differences between the positive and negative SRS Acceleration traces. 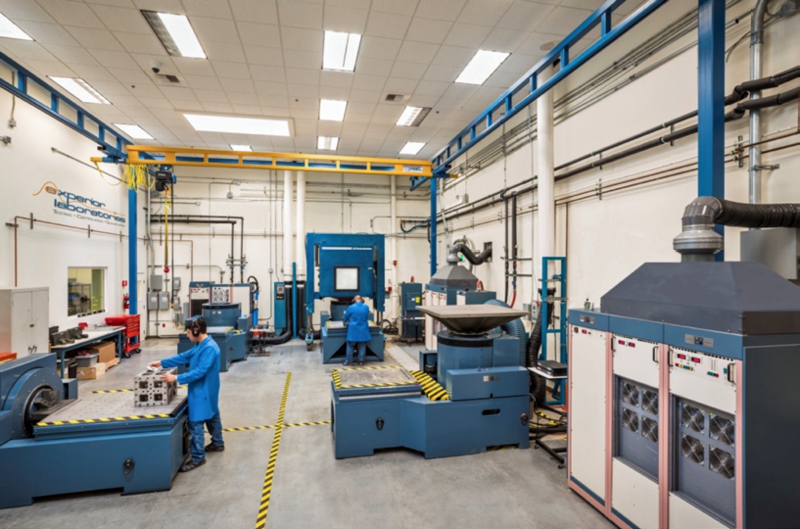 With the use of 3D simulation and frequency analysis software, Experior Laboratories has designed a suite of custom shock platforms and fixtures tailored to each individual unit. Frequency analysis allows identification of mode shapes and resonant frequencies, which lets us prevent cross-axis acceleration and ensure that units are not over-tested. Gerrit Lane joined the Experior Laboratories dynamics test team in 2015 and has worked on development and implementation of the KIPS Pyroshock simulation system for use in high G SRS. He serves as a Project Engineer overseeing vibration and shock test programs and pursuing expansion of dynamic testing methods and capabilities. He may be contacted at glane@experiorlabs.com.